UK, 2015, 128 minutes, Colour. Amy Winehouse made her mark on the world, the world of popular music, having a career that spanned ten years, winning several Grammy awards, including Best Song with Rehab, an award for Best young British talent of the year, praised as having a strong voice for jazz. That may mean that while she did have a large following, there are a lot of people who knew her only from headlines or from tabloid stories. And she certainly had a tabloid kind of life, a celebrity who rose high and certainly fell low. Asif Kapadia has made a number of documentaries as well as some feature films, especially The Warrior, set in India, and the documentary biography of racing driver Ayrton Senna. He received quite some praise for that documentary and already has won critical praise for this film about Amy Winehouse. The director has been skilful in assembling his material, sometimes having voice-over of Amy with different pieces of footage or photos from other times, making the impact of his images and sound more complex. 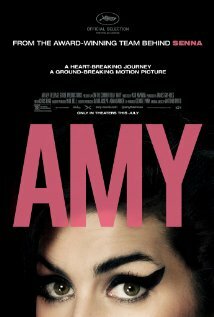 The film is put together in chronological order, with some flashbacks to Amy’s life as a child and growing up. it is a picture of a Jewish girl from North London - and images of Barbra Streisand come to mind as we see her, her looks, her forthright manner, her strong voice and singing style. Her father was absent during a lot of her childhood but emerged later and undertook her management, criticising this present film for not doing justice to his daughter and putting him in a bad light – and his wanting to make his own film, something of which he did during his daughter’s lifetime. Audiences interested in the music industry will find that there is meticulous detail about and interviews from those involved with her career, as they worked with her and helped her, the difficulties they experienced, especially in her final years, the successful concerts, records, the Grammys. The range of people interviewed gives an overall picture of Amy Whitehouse’s career. On the personal level, it is said that she was shy even though she came across publicly as one of those forthright Jewish personalities. She did smoke pot in her early years, but eventually was introduced to cocaine, which led to heroin – and the comment made by her during the film that life without drugs was boring. It also emerges that what looked like to be a hearty appetite was, in fact, bulimia. She had many boyfriends, friends commenting on some promiscuity in her life, marrying a boyfriend who may have been instrumental in the drug use, supporting him when he was arrested and imprisoned for impeding the course of justice, the marriage ending after two years in divorce. The other point that the film wants to make is that she had celebrity thrust upon her very early, like many a child actor, performer, sports man or woman, which means that they were still developing their personality while expected to be competent in coping with the wider world – and being cut off more and more from the difficulties of real life, being pampered and spoilt, people responding to their whims, paparazzi pursuing them, and not enough time to be by themselves, to think, to appreciate what was happening to them. This is significant for Amy Whitehouse’s songs. She is praised by many, by a singer she greatly admired, Tony Bennett, with whom she did a duet, filmed and shown here. She appreciated singers like Sarah Vaughan and was considered to have a wonderful sense of jazz, rhythms and timing. The lyrics which appear during the film, often literally on screen, help the audience realise that they were all about her, her life, her feelings, her relationships, not exactly narcissistic, but self-preoccupied, using the lyrics and the rhythms to express a lot of her troubled personality and what was happening in her inner and her out of life. Some have complained that the film does not include everything – but, after all, it runs just over two hours and there will be necessary omissions from the point of view of the selection of the director. While it does serve as a basic biography, it is, more importantly, a cinema portrait.